This procedure presents a bodybuilding program which is designed to measure and maximize Power production. 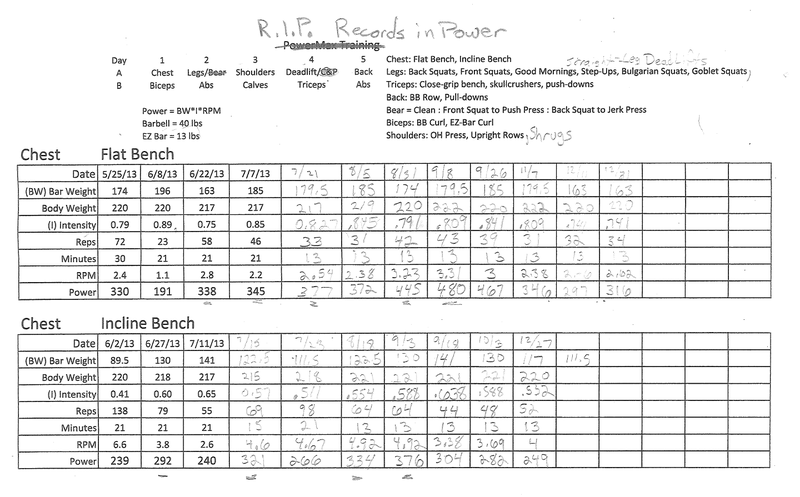 While most programs focus on either Strength or Hypertrophy, the RIP (Records in Power) Program seeks a balance. A spreadsheet that calculates the power produced by each exercise is available via the Research Offers page. 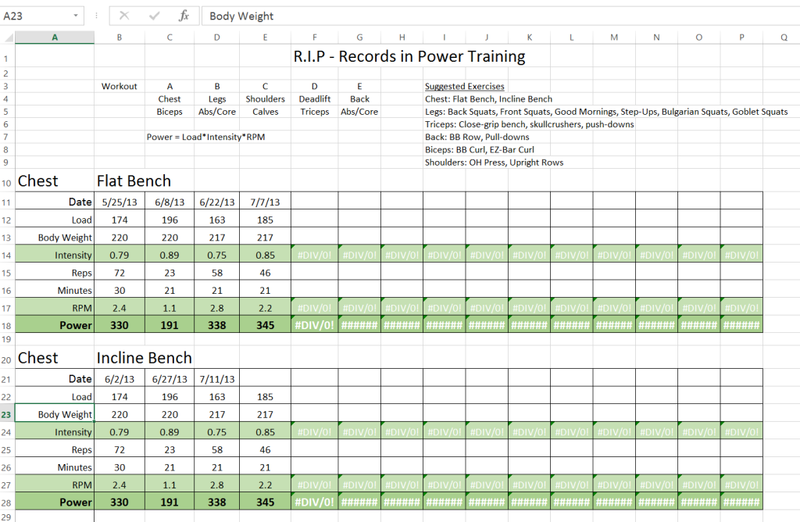 I believe this program is optimal for training of athletic power production. Athletes in most sports are not concerned with raw strength or in hypertrophy (ie. “looks”). Rather it is the production of power that is of utmost importance. Few programs directly address this need. Therefore this program may be suitable for individual athletes or sports teams. The collection of power data for each lift may naturally lead to competition among the athletes. The combination of load, intensity, and velocity determine muscular power. It is this equation which should be measured, and maximized over the course of the training program. ‘Load’ appears twice in the Power equation, displaying the importance of raw strength as a measure of power. Utilizing Body Weight in the Intensity equation allows a fairer comparison between the athletes. 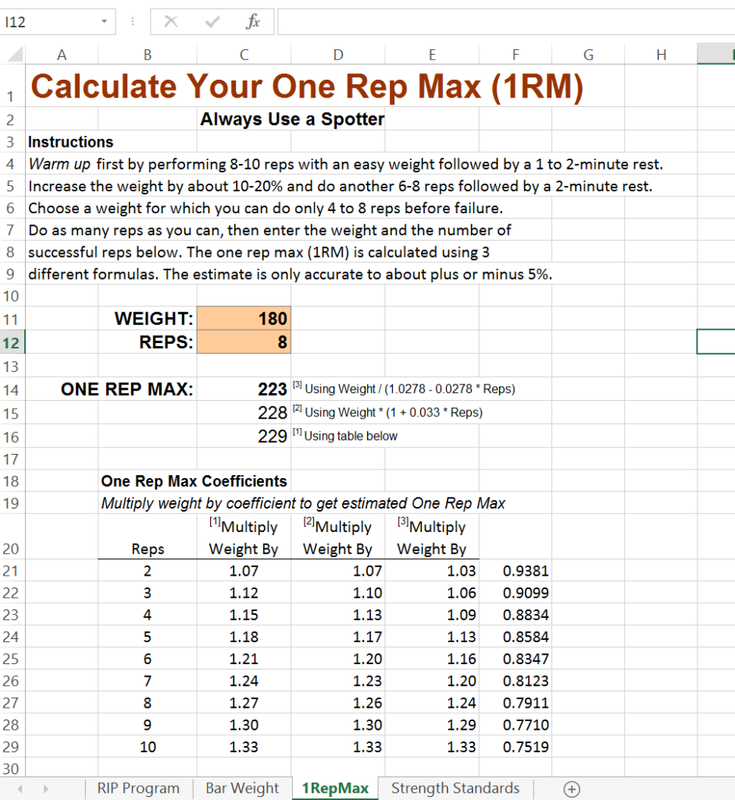 Reps per minute provides a simple way to measure the speed of movement (velocity). Records in Power (RIP) is a timed program. 21 minutes for the major lifts, 13 minutes for assistance exercises. The number of reps completed within the 21 or 13 minute period is recorded, and the above formula is utilized to calculate the power produced. The athlete varies the load each successive workout in an effort to maximize power. Power is a function of the load (weight lifted) and the number of reps the athlete is capable of performing within the 21/13 minute period. Chest Bench Press Flat/Incline 21 min. Biceps Bicep Curl Barbell/EZ – Bar 13 min. Legs Squat Back/Front 21 min. Abs/Core various various 13 min. Shoulders Overhead Press Front/Back 21 min. Calves Bent-over Rows na 13 min. Legs Deadlift na 21 min. Triceps Skullcrushers na 13 min. Abs/Core various na 13 min. The athlete may vary the number of sets, reps per set, and rest period between sets as he/she sees fit in order to increase the total reps (and thus total Power) in the timed workout. This program will lead to a ‘Rest-Pause’ type of lifting, with shorter rest periods (30 seconds to 1.5 minutes) between sets. It is generally beneficial to not go to failure on each set, rather leave a rep or two “in the tank” so you can be more productive for the entire 21 or 13 minutes. The next time the athlete repeats an exercise, he/she must decide on the load to use. Reviewing the history of the exercise will aid in knowing whether to increase or decrease the load. These are the ‘irregular jumps’ which will bring you to the goal of maximizing the power your body is capable of producing. An excel spreadsheet for completing this program is available via the Research Offers page. The spreadsheet solves the Power equation above. 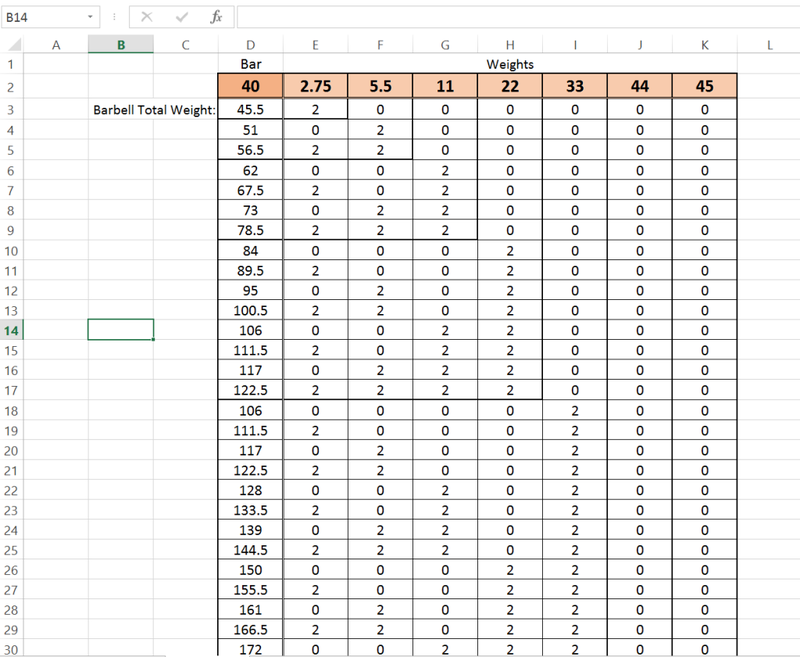 1) a chart to calculate the Loaded barbell weight; the user can input their own gym plate poundages initially, then use the chart to quickly look up the total weight. 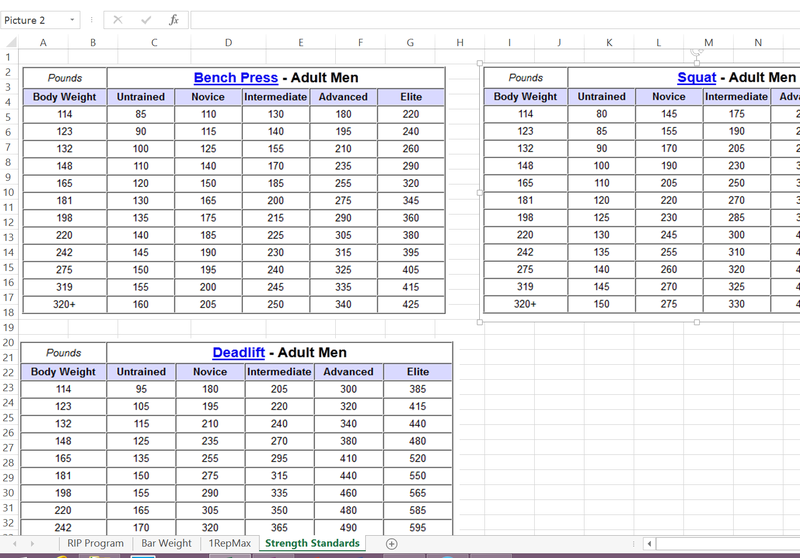 3) a Strength Standards chart for Bench, Squat and Deadlift. Because this program demands up to 21 minutes of concentrated work on the major lifts, it may be difficult to perform in a crowded public gym where equipment is expected to be shared. Private gyms, athletic facilities, and home-based gyms are ideal. Consult a Physician before beginning any exercise regimen. My equation for muscular power results primarily from deductive reasoning as well as research on the bodybuilding force-velocity curve. Although Cross-fit was not a direct inspiration or reference, there is a similarity as both are timed programs. The ‘Records in Power’ workout program is available via the Research Offers Page. Does this product add value and knowledge to your training regimen?